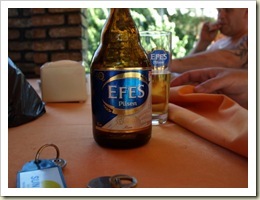 Well, the beer is good too, but I was talking about the ancient Greek city Efes. Also known as Ephesus, it is located about 10 miles from the Aegean coast in Turkey. It is incredible how much of the city is left. The library, the brothel, the communal toilets. I know you are thinking, who is this girl? 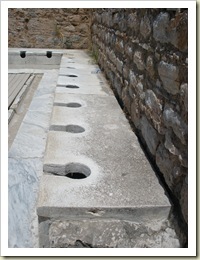 She goes to an ancient ruin and takes photos of the potty? Well people, it is all about class. Also, I could not locate the brothel. 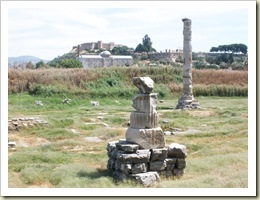 Efes, in addition to having a spectacularly preserved city center, including amphitheaters and terrace houses, was also the location of the Temple of Artemis (built around 550 BC) which was one of the Seven Wonders of the Ancient World. The Temple was destroyed in 401 AD by a mob, reconstructed, then later destroyed again in an earthquake. There is not much left beyond this pillar and a large depression in the ground. However you can see the scale from the rubble that is left over, and it was enormous. The city of Efes lost its importance as the river silt filled up the bay and the port town was no longer on the sea, and was eventually abandoned. However nowadays the city is packed. Tourists from all over scatter like ants on the ancient ruins. What is really interesting is watching them compete for prime photo spots. Some people wait in line, and others just jump right in. Which causes conflict. A few times I was tempted to sit down an d watch the fight. The amphitheater where the gladiators fought is right there, they could just move the fight over there. Come on, jostling for photo opportunities, fighting to the death, same thing right? After seeing Efes, we lumbered back into the van to continue our drive to Marmaris, where my parents would meet his parents. Not awkward at all. 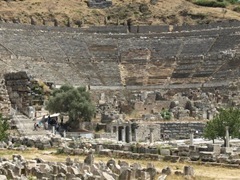 This entry was posted in Ephesus, Turkey, Vacation and tagged Expat, Turkey by Jules. Bookmark the permalink.